When a drum of food waste in a commercial kitchen is full, it needs to go for composting. Restaurants that don’t have their own gardens will need to send their food waste for commercial composting. It is beneficial for the commercial compost facility to accept the bokashi food waste because of the EM inside the bokashi and the food waste also adds bulk and moisture to the composting windrows. EM is often purchased by a commercial compost facility in order to speed up the decomposition of the compost. Bokashi Bran has a business opportunity for an entrepreneur. We are looking for partners in the Gauteng area to collect the drums from restaurants and take them for commercial composting. Contact Bronwyn on 082 456 9225 for more information. Tipping bokashi food waste into the top of the windrow. 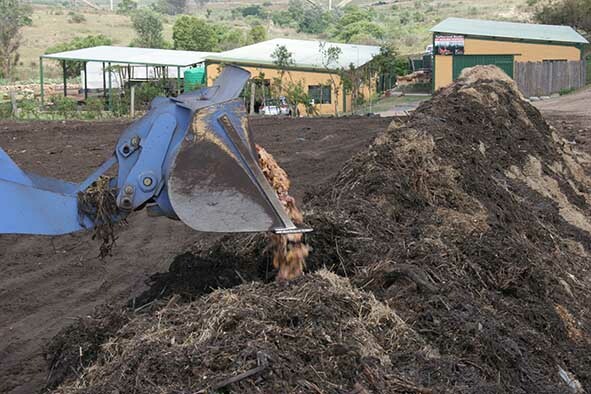 The easiest method for commercial composting bokashi food waste is for the earth-moving equipment to make a hole in the top of the windrow. The drums from the restaurant with the bokashi food waste are emptied into the loader skip. It is then tipped into the top of the windrow and covered with compost. After a week, the windrow is turned as normal. With the heat build-up and EM inside the bokashi, all the food waste will have completely decomposed. The compost will continue the normal cycle of being turned every week until it is screened and ready for sale. 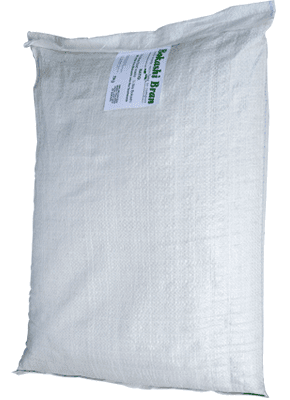 This organic compost will have excellent levels of potassium, phosphorous, calcium, magnesium and manganese. The organic carbon content is also high which is essential for healthy soil. Commercial composting for restaurant food waste management is the most eco-friendly option because the food waste doesn’t rot resulting in CO2 emissions. It is “recycled” so that it can be used in a beneficial way for food farming.